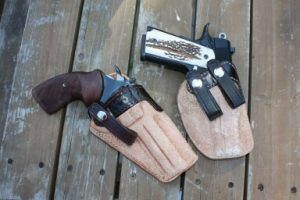 The Executive Solution, for revolvers and semi-autos features a rough-out exterior and smooth interior, and D&D GUNLEATHER’s exclusive T-Bar, which keeps the holster open for one-hand re-holstering. D&D GUNLEATHER builds custom, HAND-CRAFTED professional-level holsters that are HAND-molded (wet) to the gun, HAND-stitched, HAND-boned, HAND-dyed and HAND-finished (edges are all burnished) and then HAND-rubbed with a proprietary treatment that helps prevent sweat-through. D&D GUNLEATHER’S “UNDERSHIRT” based on Dave Workman’s original design. For deep cover of small pistols and revolvers it tucks under a shirt, inside the waistband. D&D GUNLEATHER pioneered the breakthrough “tuckable” concealed carry holster, enabling you to carry a concealed handgun with a shirt tucked over it. This design has been widely imitated. This is the original concept. The T-BAR TOO, for semi-autos and revolvers is an IWB rig hand-boned to a specific pistol. Features D&D GUNLEATHER’s exclusive “T-Bar” that allows one-hand re-holstering. D&D GUNLEATHER has a select clientele and thus builds holsters one at a time. There is no mass production and no shortcuts to high quality. 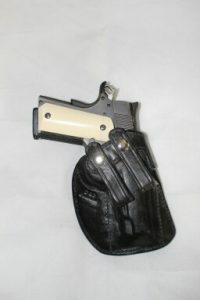 Each holster starts from premium leather stock and is painstakingly crafted over several hours. D&D GUNLEATHER has developed several standard, and very popular, holster styles. 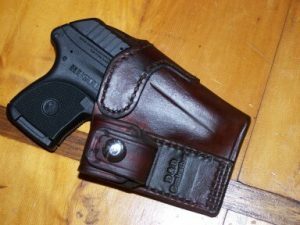 If you need a custom application, contact Dave directly – since each holster is individually made upon order, custom details are easy to incorporate, often for minimal additional cost. 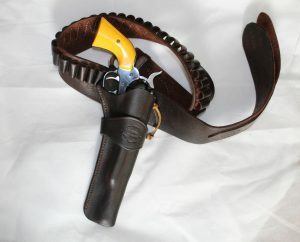 ROUGH-OUT belt with holster (sold separately). 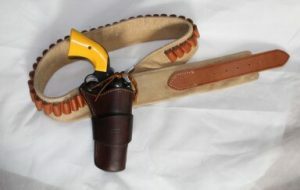 Traditional holster and cartridge belt for single-actions. 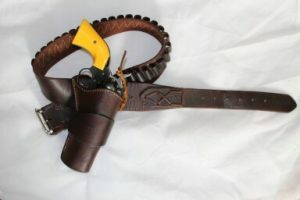 CHECK OUT “Dave’s Western Wear” with holsters and cartridge belts featuring an Old West flavor. Western rig with adjustable billet. Holster sold separately. Dave Workman is also a recognized authority on the carry and use of firearms, and gun laws in Washington State. He is a professional journalist, author and gun writer. “Guns,” he says, “are my beat.” He has authored or co-authored several books on firearms politics, and is interviewed regularly by talk radio around the country. He was profiled by the American Shooting Journal in May 2018.